The process of setting the agenda in a national parliament is highly important, but despite this, it often takes place behind closed doors and is therefore difficult to account for. Simon Otjes presents evidence from the Netherlands, where agenda-setting is carried out in public. He highlights that the politics of agenda-setting follows the pattern of politics as usual: the division between government and opposition, ideological distance and issue attention shape agenda-setting, as they do decision-making more generally. Agenda-setting is a fundamental process in parliaments: a parliament can only make decisions about issues that are actually put on the agenda. Political scientists, including renowned thinkers like Bachrach and Baratz and Steven Lukes, have always emphasised that the process of agenda-setting is invisible. We can see which issues are put on the agenda, but we cannot see how they got there. That means that we cannot see who really exerts power over the agenda. This is true for many European parliaments: decisions on what gets on the agenda are made behind closed doors by the Speaker or some agenda-setting committee. But in the Netherlands these decisions are actually made in public. At the beginning of every day parliament is in session, MPs meet to decide on the agenda for the coming days. This provides a unique possibility to observe the process of agenda-setting. Who makes the proposals for items to be debated? Who supports such proposals and who blocks them? And do MPs even sabotage proposals of their colleagues? These are the questions I addressed in a recent study, looking at a sample of all these short agenda-setting meetings of the lower house of the Dutch parliament between 1998 and 2017. In these sessions, decisions are made about all plenary debates. These can be legislative debates or debates that are organised to discuss recent events that require the attention of government. There is a clear division between these two kinds of debates. The decision-making on legislative debates is depoliticised. The Speaker proposes to put these items on the agenda and these proposals are almost never contested. The proposals to put non-legislative debates on the agenda are far more controversial. MPs propose to hold such debates to draw public attention to mistakes made by the government or to introduce resolutions that offer solutions for those problems. My central finding was that decision-making on agenda-setting amounts to politics as usual. There are three patterns that structure both decision-making about the agenda and decision-making on bills, amendments or resolutions: first, there is a clear opposition-coalition division. Opposition parties make two-and-a-half times as many proposals for the agenda than coalition parties. 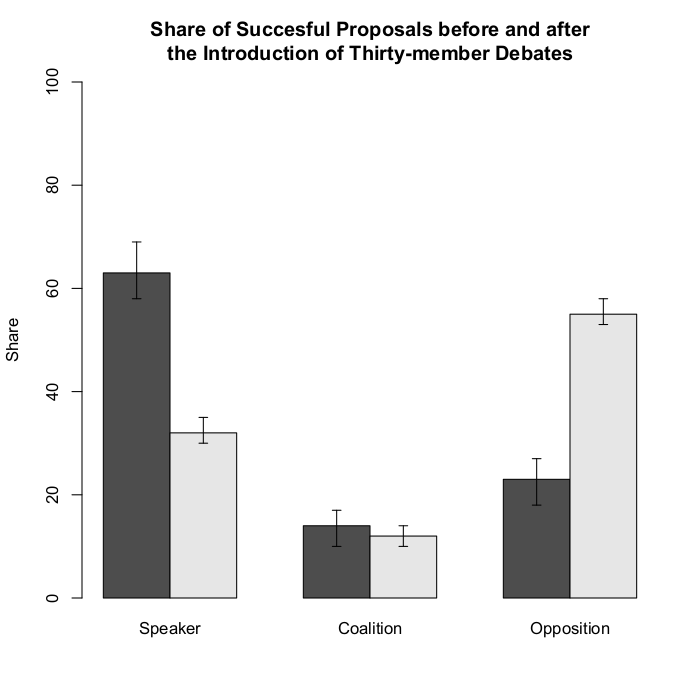 One can also see this division in decision-making on whether a proposed debate should be held: a party is more likely to support a proposal, if it is made by a party that is on the same side of the coalition-opposition divide. MPs of coalition parties even go so far as to sabotage proposals by the opposition: they do this in subtle ways. They propose to wait with scheduling a debate until the minister has sent a letter. This postpones these debates and gives the minister the ability to take the sting out of the issue. Second, left-right ideology plays a role. The larger the distance between a party and the government, the more likely that it proposes agenda items. The smaller the distance between two parties, the more likely that they support each other’s proposals for agenda-items and the less likely that they sabotage them. Finally, there is issue attention. Parties are likely to propose agenda items on issues that they prioritise in their manifesto. Moreover, they are more likely to support proposals on the issue that they prioritise. The net-result of these patterns is that opposition parties that are distant from the government propose agenda items and that coalition parties attempt to block and sabotage proposals from the agenda. Until 2004, the governing majority had the power to block new agenda items. In order to open up the political system a new kind of debate was introduced: the thirty-member debate. Since then, a fifth of parliament was sufficient to schedule a debate. Opposition parties embraced this opportunity to schedule debates. As a result of this, the control over the plenary agenda shifted: where before 2004 the majority of the successful agenda proposals were made by the Speaker and represented final debates on issues that were already dealt with in committee, after 2004 the agenda was set by opposition MPs. Figure 1 illustrates this change. The Dutch parliament certainly is an exceptional case: the openness of the agenda-setting procedure makes the coalition less likely to wield its power to determine the agenda bluntly. Moreover, in many countries, minorities are not granted the right to dominate the agenda as they are in the Netherlands. Yet the patterns that we see show that the politics of agenda-setting follows the pattern of politics as usual: the division between government and opposition, ideological distance and issue attention shape agenda-setting as they do decision-making on issues that are on the agenda. This makes it likely that where decision-making occurs behind closed doors the same patterns are present. Simon Otjes is an Assistant Professor at Leiden University and a Researcher at the Documentation Centre Dutch Political Parties of Groningen University.